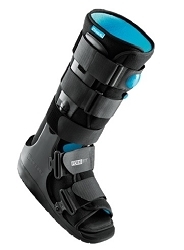 The DeRoyal Inline Pneumatic Ankle Walker features an inflatable air bladder wrap for compression and stabilization of foot or ankle fractures. 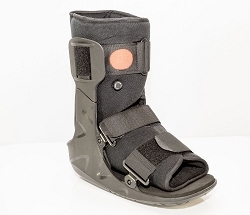 This medical boot offers a Low profile rocker sole that promotes natural gait and provides a wide foot plate for patient comfort and stability. Rigid, flared uprights provide stability. 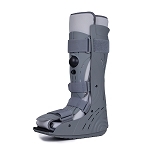 Rocker bottom sole provides a natural gait pattern. Flat, wide foot bed is comfortable/provides great stability. Tread sole for safety outside. 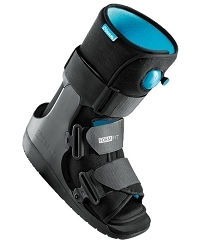 Choose between closed heel (boot's plastic comes rises up to help contain your heel) or open heel version ( a strap contains the heel where boot plastic normally would be - for use when heel dressings in the rear need more space). 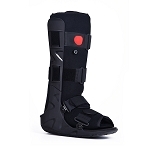 Standard Height with Open Heel - allows more room for incisions behind the heel. 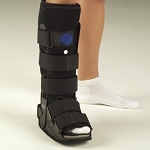 Standard Height with Closed Heel - most common.